Pulled meat and avocado are two delicious food trends which work wonderfully in combination. 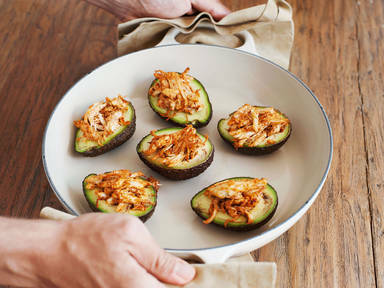 The spiciness of the pulled chicken is balanced out well by the creaminess of the avocado, and makes for a amazing brunch addition, tasty lunch, or light dinner. Opt for organic meat, in spirit of the Paleo spirit. Try this recipe, from Michaela and Nico Richter of Paleo 360, for healthy proteins, good fats, and amazing aromas. It is low-carb and thus suitable for a ketogenic diet. Take a look at the video for the full recipe!